I have just returned from a couple of hours at the Roundhouse with a group of bloggers invited there by VIA Architecture. I was pleased to chat with fellow local bloggers Gordon Price, Erika Rathje, Richard Eriksson, Karen Fung and Mike Klassen. There were nibbles and drinks courtesy of our hosts who are keen to continue the great urban debate (or perhaps that should be conversation) and will also be holding a similar meetup for local bloggers in Seattle. VIA have their own blog too. Towards the end of the evening I managed to get to talk to Graham McGarva. I told him that one of the reasons I was intrigued by their invitation was that it mentioned their current work on the Evergreen Line. I had thought that project stalled for lack of funds, but apparently work is still proceeding on planning – specifically on determining the precise alignment, and its effect on local land use. The project may be stalled now by the absence of sufficient funding, but it is assumed that can be resolved, somehow. While it is not clear yet how that might happen one possible answer would be trimming the specification: after all, that was how the Canada Line got built, when its budget was not enough to pay for all that was originally desired. It is also possible that Translink may be able to come up with more funds through property development. Again this is something that Translink has been looking at for over a year now, but has yet to make any specific proposals. Graham and I last worked together back when the Millennium Line was at a similar stage of development. He told me an interesting story tonight that I had not heard before of how the retail development at Broadway and Commercial was achieved. This is one of the few stations on the Translink system which actually manages to be truly an urban place, through a modest but strategically located retail building on the north east corner of the intersection. As architects they had no power of decision making but they could be, as he put it, “in all three rooms”. That is they were trusted by the client (the province’s project office) the City and the local community. They were therefore able to determine what each would accept – and thus came up with a proposal for the small parcel of land owned by the project but not actually needed for the station itself. There were several possibilities – and a quick look around most transit stations in this region will show that they are rarely as successfully resolved. Hopefully, the Evergreen Line will get started in earnest, and when it does the involvement of a firm like this gives me some hope that we will really see some worthwhile transit oriented development in this region, something I feel is long overdue. Thanks are due to my friend Eric Doherty who has been using the list serves and the Livable Blog to draw attention to a new report from the Campaign for Better Transport in the UK. They have been digging through the “post-opening project evaluation” reports that the Highways Agency there uses to examine the “schemes” that they have built. They go back one year and five years after a new road is built, or widened, and look at the impact compared to what was forecast before the project started. In other words, they look at what was forecast to happen and what actually happened. These reports are remarkably detailed, clearly objective and look at a range of data – not just the vehicle flow. We, of course, do not do that here. Each year the Highways Agency spends around one billion pounds building and widening trunk roads. Ministers decide whether to invest in motorways and A-roads based on the Agency’s detailed economic analysis. Their evidence is supposed to spell out what the impact of road building would be: the impact on the economy, on the local environment, on traffic and on greenhouse gas emissions. These forecasts need to be reliable, because of the amount of money being spent and the potential for severe impact on congestion, traffic and the environment. Unfortunately a number of reports commissioned by the Highways Agency show that these forecasts cannot be relied upon. Instead of accurately predicting what will happen, the Agency’s forecasts underestimate the effect on traffic, air quality, noise and greenhouse gas emissions. They also fail to predict the economic impact and whether schemes will be good value for money. post-opening project evaluation reports (POPE) found that overall traffic levels rose significantly as a direct result of each scheme. Two of the three bypasses studied simply moved the congestion elsewhere. Forecasting was generally inaccurate, especially of future traffic levels, and the economic forecasts did not reflect the actual impact on local businesses. CO2, air quality and noise impacts are generally worse than expected, and walking, cycling and public transport did not improve, even on local roads where traffic has decreased. That last bit is significant for us too. As in the UK, major road building projects here – such as the Highway 1 widening – are claimed by the government and Translink to improve cycling and transit (I don’t recall them even mentioning walking!). Some of the problems reside in the limitations of the available transportation models. Perhaps the greatest weakness has always been their inability to understand the way that projects induce traffic – by encouraging more and longer trips – but also change the way that land in the region around the project is used. The model used for all the Gateway projects, and for the Sea to Sky Highway widening, simply used the same land use and population distribution forecasts for all future scenarios. In other words, the number and distance of trips in the future was fixed as a factor of land use (population in residentially zoned areas, employment in others and so on) – and while that land use was different from the “before” case it was the same in both the “with project” and “without project” future cases. This, of course, both understates traffic growth, but also overstates benefits in terms of travel time savings ascribed to the project. Underestimating future traffic in our case means that environmental impacts such as noise, air pollution or greenhouses gas emissions are also less than reality, but show up as lower “costs” on the evaluation. More importantly, it also creates the illusion that congested will be lower in future. As Gordon Price has been saying about the Gateway for years, just tell us one place where road building has worked to reduce congestion. The five year after (5YA) reports found that overall traffic increased substantially once each new road was opened. This was substantially higher than the background level of traffic growth and each report attributed this to new trips generated by road building. In the UK they talk about “trips generated” but here we use the term “induced” – because the model itself uses the term “trip generation” for the function by which it forecasts travel based on population distribution. The reports show that traffic growth was not limited to new road space; while in each case some drivers using local roads switched to the new road (providing limited congestion relief on minor roads), nearby roads tended to see large increases of traffic. That is going to be one of the most significant impacts of the Highway #1 widening, and one which the government has deliberately under estimated, as a way to calm the real fears from neighbourhoods that will be swamped with new traffic. It is being explicitly dealt with by engineers in both Burnaby and Vancouver – to the extent that they can. But I suspect that there will be howls of rage from the very people who currently expect better travel conditions south of the Fraser once the new bridge opens. Of course, we have seen this effect before – just ask those who were here when the Alex Fraser Bridge opened. Once again, the model simply assumes that the same number and length of trips are better distributed on an enlarged network that has greater capacity. But since induced travel is not factored into the equation, the forecasts are wildly misleading. It is not as if any of this is new either. As earlier blog posts attest. Eric thinks we need a moratorium on building new roads here, just like the one the UK Campaign wants. I would agree, except that I don’t think it needs to be a temporary halt to projects until we can do a better job of project evaluation. We need to stop increasing the capacity of the highway system because we know that not only does it not cure congestion, but if we are to reduce our impact on the planet significantly we have to take drastic steps to reduce the use of cars. Indeed, if all we wanted to do was reduce congestion, simply spending the same amount of dollars on transit projects would be a good start, but we would still need to do something about land use AND we would still need to find a way to finance transit operations and maintenance. A road building moratorium might be a good gesture, but it would not deal with the fundamental problem. In North America we drive single occupant vehicles too often and too far – and we claim that this is “necessary” because we are locked into a car dependent land use pattern we are reluctant to see changed. 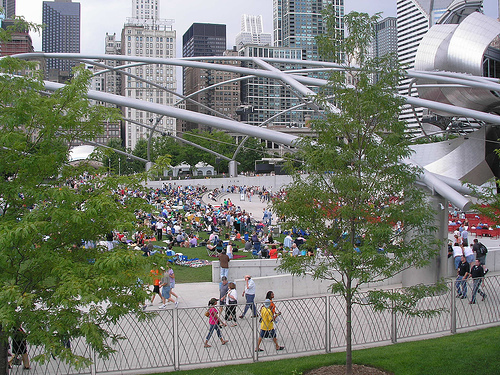 Until there are viable alternatives – and better designed communities – I cannot see that changing. 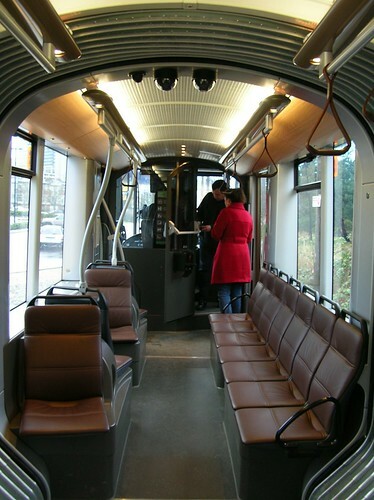 On Thursday, January 21, the Olympic Line – Vancouver’s 2010 Streetcar – will begin service following a launch celebration hosted by the City of Vancouver. In advance of the launch, Bombardier and the City of Vancouver invited a small group of media and bloggers for an “exclusive sneak preview” of the BOMBARDIER FLEXITY streetcars and to meet one of the operators who will be driving the streetcars. Well, exclusive of some but not exactly “an exclusive”. It will be on CTV News tonight, and bloggers Mike Klassen and Rebecca Bollwit will be covering it too. Tomorrow and Sunday the Sun and Province will catch up as well. I cannot say I was impressed by the questions that were being asked by the now in bankruptcy protection main stream media reporter – he seem surprised that a streetcar did not have a steering wheel! 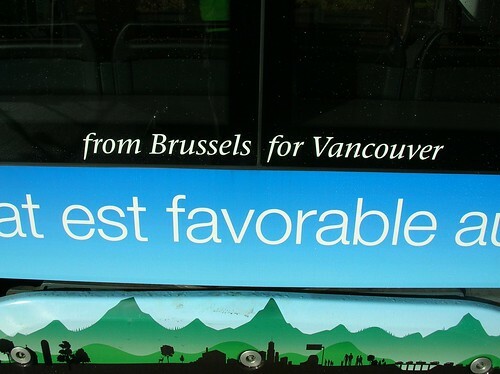 But, to be fair, conversation with their photographer showed that there is someone on their staff who understands transit. It’s a shame he does not get to write about it. For a sneak preview they were not able to actually run the streetcar. This is was great pity – since the other car was running for driver training, which means there will be moving pictures. I suspect that issues of liability and lack of qualified staff might be the reasons. I would like to be able to report that the ride was smooth and quiet – though you can judge for yourselves when you hear the video of the exterior noise anyway. It ought to be very smooth indeed. The City of Vancouver has spent $8m on 1.8km of track upgrades. For that money I would expect an excellent ride, and certainly when comparing the old and new track at the east end of station at “Olympic Village” you can see the difference. 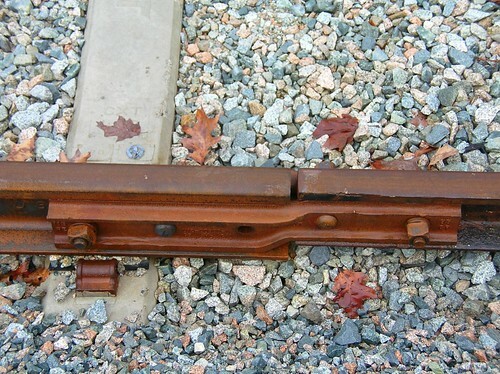 Heavier rail, concrete ties (“sleepers”) and insulated Pandrol® rail clips as well as some significant amount of new ballast. CMHC also kicked in $0.5m – and some money got spent on upgrading the power line and building a new station. But it is still single track, with a 150m passing loop. Another $50 to $60m would be needed to get a workable system going into downtown – and the City is still looking for funding partners. Unlike Portland OR, who were so convinced that streetcars were the answer, they paid the whole lot themselves for the first segment. 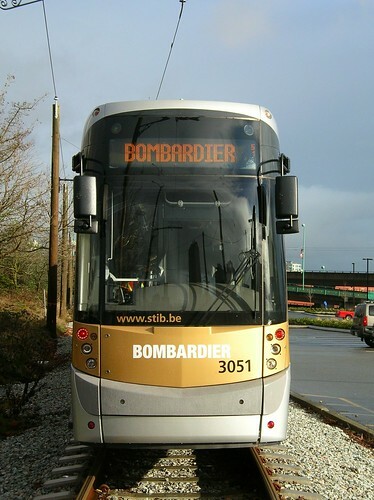 Bombardier were being coy about how much they are spending – but it includes lease payments to STIB the cars’ owner, to cover things like lost fare revenue, as well as the considerable shipping costs from Europe to the Pacific North West. While in town here, Bombardier has invited its customers (and, I bet, prospects too) to come over and experience the ride for themselves. Bombardier are also going to make a donation to the Transit Museum Society – who run the line – to reflect the large number of volunteer hours. 32 people have volunteered to drive the trams including Bernie Eide – a former CN/BC Rail driver who was on hand to talk about the car and the history of streetcars in Vancouver. I will spare you that, but I will be interested to see how much of what he says survives in the MSM coverage. He says that it is “an amazing ride” – but I hope he is not comparing it to his usual ride in a freight train locomotive. Leather seats, of course, attracted a lot of attention. I doubt that anyone will notice that actually leather is probably a lower life cycle cost alternate to some of the cheap plastic normally seen on North American transit seats. 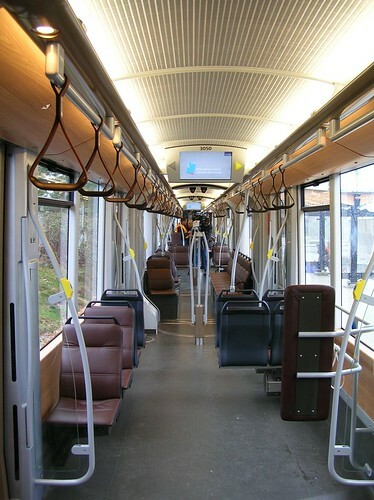 The interior ambience is certainly very pleasant and yes, it does have “that new tram smell”. The cars are actually new and so far unused in service in Brussels – although others of the same type are running there now. 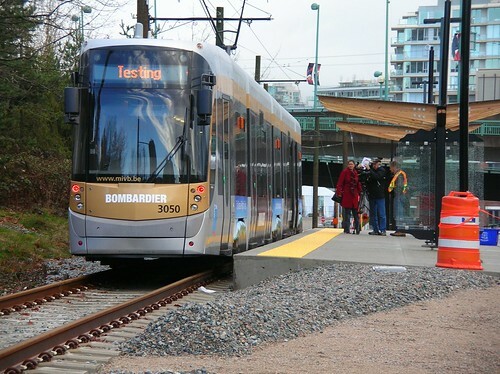 The FLEXITY streetcars will provide a free service, 18 hours a day, 7 days a week, between January 21 and March 21, 2010 between Olympic Village and Granville Island. The service starts at 9:30am next Thursday – with, of course, all the usual ceremony and cvic dignitaries, as well as some Olympic athletes. Bombardier were quick to point out that their spending on the project is in addition to their olympic sponsorship, but nicely complements it. Don Cayo in the Vancouver Sun has a longish opinion piece on a new campaign of opposition to the increase in parking taxes downtown. It is all very predictable – with the usual suspects lining up to vent – including Charles Gauthier, who has regularly featured on this blog. It is perhaps a little late for the campaign. Much more effective, surely, would have been some activity while Translink was still in consultation mode. After all, regional bodies here are much more responsive to organized business interests – the truckers and the Gateway Council for instance – than they are to community groups or public opinion. What transit users think, of course, has never mattered at all. But campaigns by groups like this have worked. After all, the leaders of these organisations also tend to be, or be close to, BC Liberal Party insiders. As Cayo notes, an earlier, regional parking tax was killed by a similar effort. Though this one seems to be more aimed at public opinion than politicians. Actually, the people who pay to park are not a very significant component of the region’s population. Most of the parking spaces in the region are still “free” and a lot are on private land. Most are tied to other activities – shopping or employment. Increasing parking charges ought to be one of the more effective ways of influencing driver behaviour. After all, the parking charge is applied at the end of the trip, when the trip is made. So it can be avoided only of the trip is not made or diverted elsewhere. Except, it turns out, a lot of people do not pay themselves for the space they occupy. It get claimed on travel expenses or written off as a business expense. Some employers pay for parking as a benefit. Parking charges in Vancouver are, comparatively speaking, quite cheap. Much cheaper than major urban centres like London or New York – and that is partly because there is still, comparatively speaking, quite a lot of it. Though perhaps now less than there was, and probably it wil become scarcer, at least in the dense downtown core and the major business districts. I think this is just as it should be. The areas where the new rates apply are those that are best served by transit, so if there is an effect of encouraging car users to switch modes that should become apparent. It cannot happen in most of the rest of the region since transit capacity and service levels are so woefully inadequate, you have to be a “transit captive” to use it. Translink is, of course, cash strapped becuase it does not have access to adequate operating funding from senior governments. Not enough from the province, none at all from the feds. And the parking tax is part of a program of funding stabilization that also hits transit users and property tax payers – as well as drivers in general, since the gas tax has gone up too. Again, in a world where carbon emissions have to fall, just as it should be. Transit is well worth paying for: it is a public good which needs to be supported. Translink also pays for roads too, as it happens. So on the whole I do not see that this campaign really has much merit. Nor do they seem to be really on the ball in coming up with some alternative way of keeping this essential service going. Of course whenever taxes are increased there are howls of protest. But since governments in Canada have been doing their best to lower income taxes and cutting services in general, I think the limit to the protesters demands may well have been reached. Why do I talk to the CBC? Once again, I agreed to be interviewed for CBC TV. They have been up a Whistler looking at the hydrogen buses, and they wanted to talk to me about what might have been a better way to spend the money. Of course, all they really want is a sound bite. This happens every so often. I stay in. They run up, they spend a while talking while tape is rolling. They then take some other footage which can be used – with other sources of sound – in the editting suite. It might take twenty minutes to half an hour, of which a minute or two at most might be seen (or heard on CBC radio). As with nearly every issue in real life, things are rarely simple – and usually interconnected. But the world of TV news does not allow for complexity. Yes, of course, I replied. If you just wanted zero emission buses the same money would buy you 40 trolleybuses. Or if you wanted to increase transit use, 80 conventional buses. Of course, you would need more operating funds to actually use the buses – they would need operators, as well as some maintenance. By the way, the funding for the BC Transit hydrogen buses ends in 2014. No-one knows what happens to them then. Would that actually increase transit use then? Well no, not really. It would be a necessary but not a sufficient condition. We really need transit priority on the street – to make the service attractive and reliable – but we also need to have a land use pattern that makes transit use feasible. Outside of Vancouver, there are not many places where that is the case. And as long as there is inadequate transit service, not really much chance that things will change. And as long as we are spending billions on widening one freeway and building another one, not much chance of that pattern emerging either. Like I said, there really is no simple magic bullet solution. Gordon Campbell – like most politicians – loves being on tv. He enjoys the ribbon cutting moments, and always has a sound bite ready. And he is all about image. Reality, of course, is rather different. He likes to be seen in front of a hydrogen bus, because he likes people to think he is green. Actually his performance to date on the green portfolio has been worse than dismal. The huge expansion of oil, gas and coal exploration has been second only to Alberta. BC was the only province to increase its industrial greenhouse gas emissions in 2008. The carbon tax has had no measurable effect on car use – or indeed anything else. The pipeline from Alberta to the BC coast will be soon be built for the export of bitumen and the import of distillate, which means the prospect of oil tankers in the inside passage will soon be a reality. When that happens, expect the moratorium on off shore drilling for oil and gas to vanish. The increase in car use in the lower mainland will by then be seen as a minor contributor to BC burgeoning ghg production. There has not been a lot of green achievement so far – and the prospects for the near future look to be much worse. We know what we have to do to reduce ghg emissions. We have to reduce the use of fossil fuels – which first means cutting their production. Then we have to adopt a life style that is less carbon intensive. In urban areas that means we walk and cycle more – and use transit for the longer trips. Over time, motorised trip making must be reduced, which means we have to tackle land use. Transit must be electrified – which means we can use a variety of sources of energy, but we are lucky in BC in having plenty of existing hydro. Of course, we have to stop using that for other purposes like export to California to feed their fridges and air-conditioners, or for our own space heaters. There will of course be a long transition period – it cannot happen overnight – which means hybrid and battery cars will have some role – as will diesel buses, which have a service life of around 18 years. In that time we will have also brought in more bikeways, bus lanes and surface LRT. Transit oriented development will be encouraged at the points where transit service is most frequent – and will be very popular, as other ways of getting around get more difficult and expensive, since oil gets very expensive, very quickly in nearly any scenario. The good news is that we will be both happier and healthier: the more we walk, the lower the incidence of diabetes, heart disease and obesity – the three biggest threats we now face. Public health costs – one of the greatest budgetary concerns at present – could actually start to fall. But there is absolutely no need whatever for hydrogen – in buses or cars. We have all the transport technologies we need – we just need to use them more sensibly. We need a real commitment to change – not a showcase or a Potemkin village. Buying more buses is just step one – and nothing will happen until we take the steps after that – and keep going in that direction.